The rent at Capitol View on 14th Apartments ranges from $2,023 for a studio to a $4,403 two bedroom. Apartments in this building are about 22% more expensive than the Columbia Heights average. This is a pet-friendly apartment. Capitol View on 14th Apartments is a 14 minute walk from the Green Metrorail Green Line and the Yellow Metrorail Yellow Line at the U STREET METRO STATION stop. This apartment is in the Columbia Heights neighborhood in Washington D.C.. Nearby parks include Marie H Reed Recreation Center, Joan of Arc Memorial and Meridian Hill (Malcolm X) Park. Capitol View on 14th Apartments has a Walk Score of 93 out of 100. This location is a Walker’s Paradise so daily errands do not require a car. Capitol View on 14th offers remarkable amenities, sophisticated finishes, and luxury apartments in Washington DC. From an upscale lobby adorned with an original Chihuly sculpture to the hardwood flooring, quartz counter tops, and delicate glass tile backsplashes, Capitol View’s modern apartments were designed with detail in mind. Take in a panoramic view of the city from the rooftop pool, year-round fireplace, or open air kitchen. Get energized in the gym or relax in the Zen water garden. 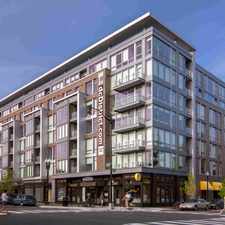 Located between the U Street Corridor and Columbia Heights, Capitol View on 14th is the Washington DC luxury apartment destination. Visit Capitol View on 14th today for a personalized tour. Ask about our furnished apartments and short term leases. Explore how far you can travel by car, bus, bike and foot from Capitol View on 14th Apartments. Capitol View on 14th Apartments has excellent transit which means transit is convenient for most trips. Car sharing is available from Zipcar, RelayRides and Hertz On Demand. 2420 14th Street Nw compared to all of Washington D.C..
How do you feel walking near 2420 14th Street Nw? Capitol View on 14th Apartments is in the Columbia Heights neighborhood. Columbia Heights is the 8th most walkable neighborhood in Washington D.C. with a neighborhood Walk Score of 94.